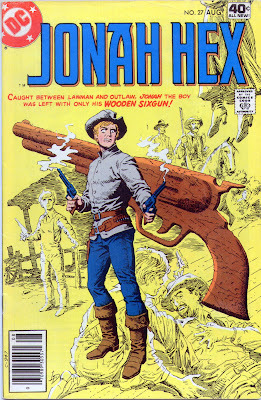 Matching Dragoons: Jonah Hex #27 "The Wooden Sixgun!" 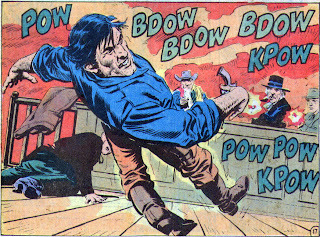 Jonah Hex #27 "The Wooden Sixgun!" Yup, I'm back. I've been repairing and painting my house myself (with the help of friends) so that explains my absence, but we're back in the saddle and Jonah is in the thick of it. We start with Jonah facing down 3 men who, of course, end up dead. 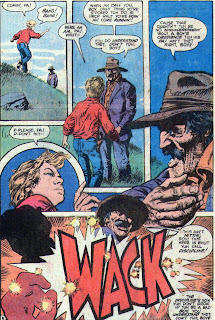 As Jonah rides out of town a young boy talks to his dad about Jonah Hex being the fastest gun ever. The dad says that there ain't no happiness in a life like that. Late that night, Jonah is sitting by his campfire when he hears someone trying to sneak up on him. He pulls his pistol and almost plugs the young boy, Timothy Walker, right between the eyes. Tim has snuck out and is hoping that Jonah can teach him how to be a gunfighter. Jonah sees that the boy has a holster with a wooden sixgun in it. Tim shows Jonah his fast draw and Jonah says that with practice the kid could be good. As Jonah pours Tim some coffee, he relates a story of a similar wooden gun that he had as a boy. "It wuz the spring of 1849 and ah'd just turned eleven..."
Jonah, as a boy, is running around playing with his wooden sixshooter when his paw calls for him. Jonah comes running but he is not fast enough for Woodson and receives a strong stroke across the chops for it and falls to the ground. Woodson has some moonshine running to do and wants Jonah to have the firewood chopped and the fence mended before he gets back that night. Woodson rides off and Jonah gets right to work...shooting rocks and jackrabbits with his toy gun. He hears someone call to him and he finds a man, shot, lying in tall grass. Jonah takes the man back to his cabin and helps bandage him up. The man gives Jonah $10 and Jonah lets it slip that he recognizes the man as Bart Mallory, a stagecoach robber. Mallory comments on Jonah's wooden gun and gives Jonah a few pointers on being a gunfighter (keep your thumb level & forward, don't wear you holster high...) when they are interrupted by a knock on the door. Jonah answers the door to find Sheriff Harper and a posse looking for Mallory. They leave a wanted poster with Jonah saying that they'll give him $5 of the $5,000 reward if he helps them catch Mallory. He couldn't have gone far since they managed to shoot him earlier. They ride off and Jonah goes back inside. Mallory thanks Jonah and offers him $5,000 all for himself, if only Jonah will help Mallory rob the Haverville bank. Jonah is astounded because nobody had robbed a bank in daylight before. Jonah says that he will help Mallory so they both saddle up & head out. On the way to Haverville, they stop at Lily's house so Mallory can get some 'recreation' while Jonah stays outside with the horses. When they ride off, they are spotted by some of the sheriff's men that were staking out Lily's place. 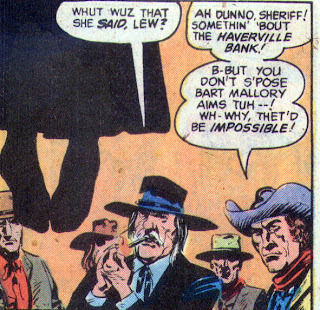 Later the Sheriff and the posse show up, demanding to know where Mallory is at. Lily says she doesn't know so, in a chilling sequence, they drag her out of her house, put her on a horse, drop a noose over her neck, and as she shouts out that Mallory mentioned the Haverville bank, they lynch her. The Sheriff and the posse decide that they can take a shortcut and beat Mallory to the bank. Jonah & Mallory ride up in front of the bank and after the dismount, Mallory gives Jonah a real pistol and tells him to watch the horses. If anyone heads for the bank, Jonah is to fire two warning shots in the air. Mallory walks into the bank, pulls his pistol and demands all of the greenbacks, saying that he has fifty men outside. Sheriff Harper and his men jump up from behind the counters and blow Mallory clean away. Harper heads outside, finding Jonah holding the horses. He hauls Jonah inside and demands to know if Jonah is an accomplice. Mallory gasps out that he kidnapped Jonah and forced him into it, Jonah is innocent. Harper gives Jonah a stern warning and Jonah hightails it home. He gets there just before dark and barely has time to hide the pistol Mallory gave him before his dad comes home. Woodson, drunk, sees that nothing has been done around the cabin, slaps Jonah to the ground and sends him to bed with no supper. In his room, Jonah practices his quick draw with is new genuine pistol. Back in the present, Tim has fallen asleep and as it starts to rain, Jonah scoops Tim up and takes him back into town to his folks. The last panel shows Jonah riding alone in the rain. Timeline - The flashback takes place in the spring of 1849, Jonah has just turned 11. In later issues, in at least two, Jonah's birthday is mentioned as being in November (by Mei Ling & Jonah himself). When this is all over I will probably have to compile how many times the November birthday is mentioned versus the spring birthday and also take into considerate how many times the 1838 birth is mentioned to determine which facts are correct. Or I could take a chill pill. I did enjoy this issue, I usually do like the flashbacks, because of getting to see a vulnerable young Jonah interact with someone other than his dad. The end of the story, with Jonah carrying Tim home, was a nice contrast to the opening with the gunning down of the three men. Also, with Harper hanging Lily just for harboring a thief, that was pretty harsh, but it also set us up for fearing for Jonah when Harper found out he was involved in the robbery. It was a nice touch. This was one of the better issues. Next Issue: One of Jonah's greatest failures and the mystery of the mute Indian. Oooh, this was a good one. And yes, being hanged just for the heck of it, seems pretty harsh. It seems to me that for all that he was a bankrobber, Mallory was a better guy than the sheriff and his posse. I think that is exactly what Fleisher was after. Being on one side of the law doesn't make you a good person. Or maybe that corruption can be found everywhere.